Online learning is not easy, says Maureen Cottrell, a science teacher at iHigh Virtual Academy, a fully-accredited virtual public high school in San Diego, California. "Many students fully expect it to be easy and then bomb out." Cottrell, who's been teaching for a decade, has spent the last two years at iHigh, the first completely online, diploma-granting school in the San Diego Unified School District. "Sure, everyone wants to cut costs," she says. "Virtual learning is seen as a tool for that. But I don’t think any educator just wants to cut costs" at the expense of quality. "One of the things we address from the ground up is keeping rigor in place." Getting WASC accreditation and recognition from the University of California Doorways system was a rigorous process. "We fought a hard battle. We don't want to lose that! We want to keep the rigor high." "You're not going to learn more easily or teach more easily; it's just different." I spoke with Cottrell about her experience as a virtual high school teacher and the advantages and drawbacks of online learning. She talks honestly about concerns of social isolation, of what's the best age for virtual learning, and of the type of teacher's personality best suited for this environment. "I don't think online learning will ever take over completely. Many teachers talk about being replaced, but I don't think that will ever happen," she says. Q: Would you say the level of curriculum at iHigh Virtual Academy is pretty rigorous? A: Yes. The problem with that is that many students get into our system and find that they didn’t know how difficult it was going to be. We see that too frequently. Slowly, we're building our reputation within San Diego schools. It spreads through students' word of mouth: "Those iHigh courses are hard!" We have systems in place to catch cheating and plagiarism and to maintain rigor; with any virtual course you have to keep that in mind. People in their 20s who've taken an online course through a university are aware that it's not easy. The younger generation has a better perception of what online learning's all about. Q: How does your job differ now that you're teaching at a virtual school? A: In the traditional classroom, I'd often have to slow down my teaching to the pace of the majority. I'd get to the end of the unit and realize I hadn't even started on nuclear chemistry. So I'd start cutting units. That’s not in place with an online system. Nothing gets cut out. We cover all the topics in a chemistry setting. The pace is rigorous; it's a lot of work, a lot of written work, a lot of helping and tutoring. It also levels the playing field when there's one system teachers are using. It's not like one high school is going to offer an easier chemistry class than another school [if it's an online curriculum]. I think the virtual world does make your life easier in a lot of ways. But it doesn’t make education easier. You're not going to learn more easily or teach more easily; it's just different. As an online teacher, how do you check for understanding? Sometimes we use Skype or Adobe Connect for virtual classroom tutoring sessions, so we're face-to-face on computer. It’s just different -- we have to develop different methods of teaching and evaluating. It's also about preference. There are a lot of teachers who would hate to use Skype all the time; they'd prefer being in the classroom. They would hate my job. I think you have to be a certain personality type and have a certain mindset to be a virtual teacher and still ensure student success. Q: What kinds of students choose iHigh Virtual Academy? A: We have two kinds of students at iHigh: One is full-time, one is dual enrollment. Dual enrollment students stay at their neighborhood school and take a few classes through us. They can do it outside the school day if that works for them, or often they've scheduled a lab period when they go into the computer lab. You have multiple kids in the room doing different online courses. They don't have to have one classroom teacher that teaches one subject; the teacher [for each course] is a virtual teacher. Students can contact their teachers and ask specific questions through the Message Center, such as, "I'm stuck, I can't figure out differential equations." Other times, it's just minor: "My computer has frozen." They will always have a mentor in the room with them who help them over the little bumps, someone who’s well versed in Apex Learning and getting around the system. Any curriculum questions the student can ask their virtual teacher. "While some students thrive in this environment, some students don't realize how much they’re going to miss the socialization." 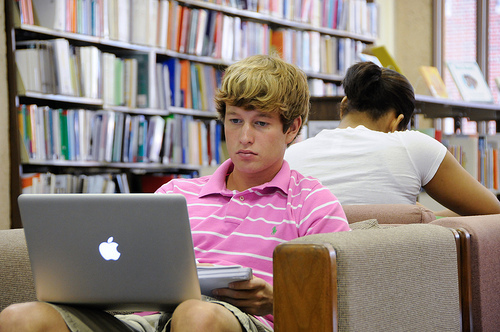 Q: How is online learning helpful for some students? A: There are students who want to accelerate and so they come to us. There are students who cannot stop being the class clown, so in the traditional classroom setting they don't do well. There are student athletes who are constantly going around the country. There are medical reasons why a student wouldn't attend to a full time school. Many students are more successful in a virtual environment, more successful than they would be in classroom. It's kind of individualized. Each student is a separate case. Also, we have a hybrid model: Students can come in and meet with a teacher face-to-face if they need more attention. As with any classroom you have some geniuses; they’ll probably need less intervention. But our teachers don't get to work from home. We have a classroom set aside here. About 20 to 30 kids come in at any given day, voluntarily -- there is no mandatory attendance. It puts the ownership in the students' hands. At iHigh, how you're going to succeed is up to you. Another feature of online learning that's a plus is the reports and evaluation. If someone’s getting behind, the teacher can contact them immediately. She can click on a student's name and see exactly how they're doing. You can have reports sent out to parents every single Sunday, with assignments, grades, and so on -- it's all automated. Parents can easily stay on top of their kids' progress. Q: What are some challenges or drawbacks of online learning? A: It definitely works, but online learning is not for everybody. The high school experience in which you’re socializing with your peers or doing sports after school is important. Virtual high school definitely fills a niche. We are a charter school, so if students don’t succeed here, they’re sent back to their neighborhood school. We'll have interventions for students for whom this was really not the right choice, who picked it for the wrong reasons. We have eighteen-year-old seniors who need a few courses more and they won't go back to regular school, so this is a last ditch effort, the only thing they’re willing to do. We try get them through. While some students thrive in this environment, some students don't realize how much they’re going to miss the socialization. We do Habitat for Humanity and other activities in the community, hold ice cream socials, or we'll get together and play Wii rock band. If students don’t participate in those activities they can feel a sense of isolation. That's why we encourage them to participate. Teenagers love to be social with each other. They miss it more than they realize. Q: Does online learning work better for older students? A: Yes, I would think high school students would be more successful than younger students. They need to have a certain maturity level to be self-sufficient. There's not someone looking over their shoulder, so they have to be more motivated. Whether a younger student would have that, I don't know. But homeschooling would work if there's a lot of parental involvement to keep them on track -- a younger person would need that. In terms of the ability to learn online, though, I don’t think there is a specific age bracket.